This report was commissioned to provide an authoritative hazardous area classification (HAC) for aviation fuelling with jet fuel and to propose internationally-acceptable direct examples. It is intended to assist all those involved in the design, construction, inspection and maintenance of aviation fuelling vehicles and all companies involved in the fuelling of commercial aircraft with jet fuel. 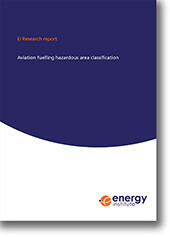 This report follows the review of existing technical information on the HAC of aircraft refuelling and provides guidance for the size and nature of zones, using the format of the direct examples given in EI Model code of safe practice Part 15: Area classification for installations handling flammable fluids (EI 15) 4th edition. The zones and their hazardous extents are taken from the literature reviewed and applied pragmatically to reflect the nature and working environment of the aircraft fuelling equipment. This publication has been created with Jet A-1/Jet A as the process fluid. If an aircraft's fuel tanks are filled with lower flash point fuels (e.g. TS-1 or AVGAS) then spills and vent vapours will have a higher risk of ignition and a specific study must be carried out to determine the extent of any hazardous zone.